Before the 19th century Ross was almost exclusively a town of stone, timber and mud, with scarcely a brick to be seen. The town was fortunate to have good building stone in an attractive red sandstone readily to hand. It could be quarried out of the cliffs below the Prospect or could be brought down the river from the quarry at Capler. Brick, however, was comparatively expensive, because the new materials had to be burnt and this required fuel. With no coal nearby, a lot of timber was needed and had to be transported. A new book "Herefordshire Bricks and Brickmakers" gives a lot of interesting detail about the relative paucity of early brick in the county. It was only in the nineteenth century when canals, and then railways, allowed cheaper mass transportation that brick prices fell. In the eighteenth century, however, the use of brick in town buildings became extremely fashionable, as could be seen in the squares of Georgian London. One building in Ross shows an ingenious solution to conforming to fashion without the extra expense of using brick - make the stone look like brick. 36 Broad Street (the ground floor is currently occupied by "Legs Clothing Co") was recently highlighted in a survey of Ross's archaeology and buildings. It is an 18th century building built of local sandstone, but with the blocks carefully cut to the size of bricks and laid in straight courses. There is even a band of lighter coloured stone between the first and second floor to give the appearance of polychrome brickwork. By the early nineteenth century, when the town's mock gothic walls, prospect tower, etc were built, fashion had swung round again. Stone was now valued for its rugged, picturesque quality and was used in large, irregular blocks. So 43 Broad Street stands as the attempt of an earlier era to give a flavour of Georgian urbanity. 36 Broad Street ("Legs Clothing Co.") was featured in the last newsletter because of its handsome Georgian façade built of stone dressed to look like brick. Inside is another historical treasure (as pointed out by Heather Hurley). 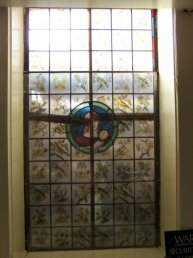 In the back room of the shop just behind the display of jeans is a row of five windows each containing good quality Victorian stained glass. 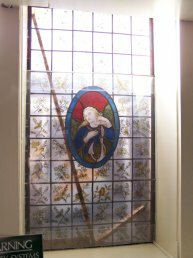 Although plenty of Victorian stained glass remains in churches, it is not so common for it to survive in a domestic context. Normally such pieces got thrown out during the 20th century as being hopelessly out-of-date. 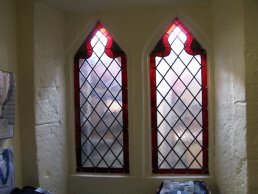 The five windows were clearly designed all of a piece, because each contains a central medallion of a classical figure, the outer four in a roundel and the central one in a larger oval. Around these medallions are quarries (small panes) with a pattern of birds, butterflies and foliage on a golden yellow background. The windows look out onto the side alley. They may have been moved from elsewhere in the building, but could be in situ, perhaps originally forming part of the decor of a hallway. 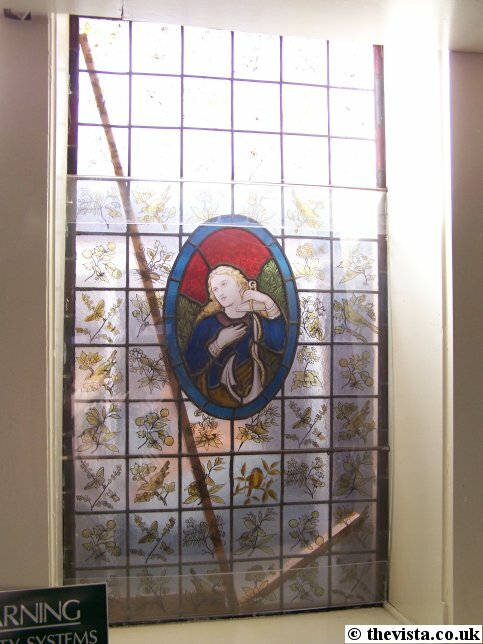 The style of the stained glass suggests it dates from c. 1870. Similar glass was produced about this time by the firm of William Morris and was designed by his colleagues, such as Philip Webb and Edward Burne-Jones, but this is probably not their work, because others followed their style. Heather Hurley said that the premises were occupied from at least as far back as 1876 by Edward Turner who ran a boot and shoe factory and shop there. There is a splendid photograph in "Remembrance of Things Past" by Fred Druce, showing the tanned hides being delivered to the premises to be turned into footwear, with the whole staff of the establishment posed outside the shop. The business carried on in reduced form until 1945. Edward Turner had two shops in Ross and others in Monmouth and Abergavenny, so was clearly a man of substance. 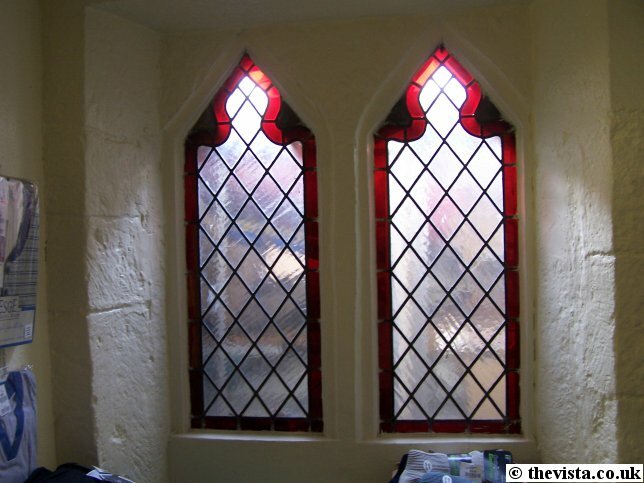 It is therefore quite possible that it was he who acquired up-to-date stained glass either to give a touch of class to his shop or to beautify his own living quarters. The present occupiers of the shop have taken an interest in the glass, exposing it to view while protecting it with perspex, so pop in and have a look -and maybe buy a pair of jeans as well.